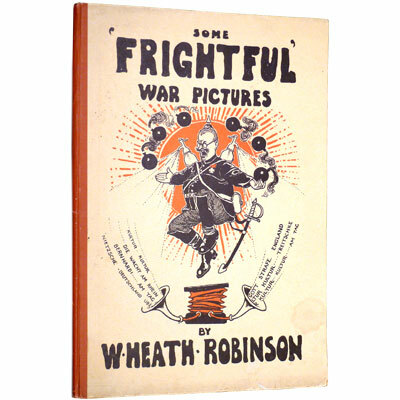 A bright and large folio first edition of W. Heath Robinson’s World War I era anti-German cartoons, with 24 full pages half-tone illustrations, illustrated title page and endpapers, with his fabulous drawings of unlikely situations, machines, ever-more-unlikely secret weapons, and various comic contraptions, each with amusing titles such as ‘The Trench Presser or Bosch Bayoneter’, ‘Using Syphons of Laughing Gas to overcome the British before an Attack in Force ’, ‘A Swiss Shepherd watching a Battle on the Frontier’, ‘Stiffnecking Tommies by directing Draughts on the British Trenches’, and ‘A Morning Tub on the Imperial Campaigning Car’. This collection of Robinson’s war illustrations had previously appeared in ‘The Sketch’ and in ‘The Illustrated Sporting and Dramatic News’. 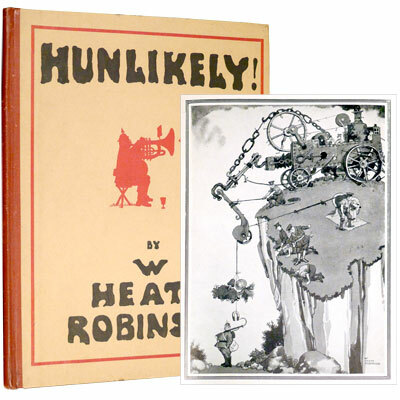 His cartoons of bizarre and improbable machinery were so popular that Britain later adopted the term ‘Heath Robinson’ to refer to absurd inventions. A bright first edition of W. Heath Robinson’s World War I era anti-German cartoons, his fabulous drawings of unlikely machines, ever-more-unlikely secret weapons, and various comic contraptions, each with amusing titles such as ‘Germans Training Wasps to Sting Highlanders’, ‘Unfortunate Mishap to a Zeppelin’, ‘The Armoured Bayonet-Curler’, and ‘British Soldiers Disguised as a Palm Grove’. Many of Robinson’s war illustrations had previously appeared in magazines and advertisements. His cartoons of bizarre and improbable machinery were so popular that Britain later adopted the term ‘Heath Robinson’ to refer to absurd inventions. Circa 1920 - Nisbet & Co. Ltd, London - Number 648 of a limited 675 numbered copies. A superb large quarto of Dulac's illustrated book masterpiece. One of a limited edition, commissioned by famed Parisian jeweller, Léonard Rosenthal. Dulac uses techniques borrowed from Persian manuscripts, such as overwashing the watercolours with silver and gold. Those approaches produced stunning results, contributing to the gem-like quality of the ten exquisite tipped-in plates with captioned tissue guards. Me No Worry– Me No Care! If He Die – Me No Cry! Signed to the first panel by Friedrich Schiff (1908-68), an Austrian Jewish artist who moved to Shanghai in 1930 after an invite to visit from a cousin and lived there for 17 years. He had worked as a newspaper cartoonist in Vienna and continued this line of work in Shanghai, soon becoming famous for his amusing caricatures of the city's inhabitants. Prolific, Schiff’s cartoons appeared in books, newspapers, magazines and advertisements throughout China and the Far East, and collaborations with Ellen Thorbecke (Peking Studies; People in China; Hong Kong; and Shanghai). 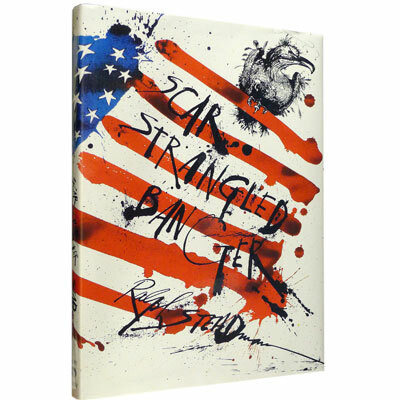 A fine, limited edition two volume set, in original cloth slipcase, of Ronald Searle’s wonderful sketches, and signed by him on the limitation page of More Scraps. More Scraps collects together a delightful selection of Searle’s previously unpublished sketches and drawings, with a foreword by Ippei Ito and an afterword by Ben Shahn and Groucho Marx. 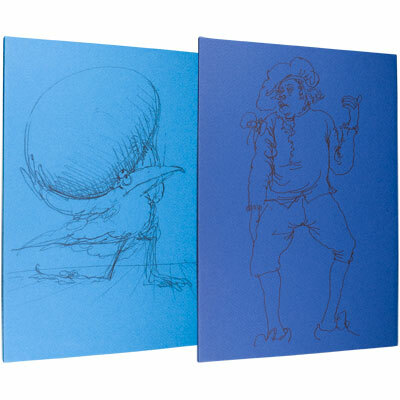 Presented with Watteau Revisited, a series of previously unpublished sketches that Searle created in 1974, when was working on a medallion design for the French Mint. The drawings were later exhibited in 1977, as part of the exhibition ‘Péleringe a Watteau’ at the Hotel de la Monnaie. 1926 - William Heinemann Ltd., London - Number 302 of 520 limited copies signed by Arthur Rackham. A beautiful example of the powerful Rackham illustrated Tempest, signed by him and containing 21 tipped-in colour plates, including an enchanting extra colour plate of Nymphs ringing the bell, not found in the standard trade edition, and in the very seldom seen original dust jacket. The limited large quarto edition bound in the publisher’s quarter vellum over cream paper boards, lettered and illustrated in gilt.